Ownership / Access: Local authority. Notes: Guildford Castle is in Guildford, Surrey, England. It is thought to have been built shortly after the 1066 invasion of England by William the Conqueror. The gardens are "extremely popular, displaying an amazing array of colourful bedding, centred on the 11th Century Castle Keep", and include a life-size statue of Alice Through the Looking Glass, which is a memorial to Lewis Carroll who lived nearby in The Chestnuts, his sisters house, from 1868 until he died in 1898. Starting in 2003 there was a year-long conservation project. The keep was partially renovated, and the first floor was floored and roofed. During this project which ended in 2004 original features such as crenellations were found to still exist. The keep now contains a visitor centre, open between April and September, that includes written panels describing the history of the castle and a model of the place as it appeared in about 1300. 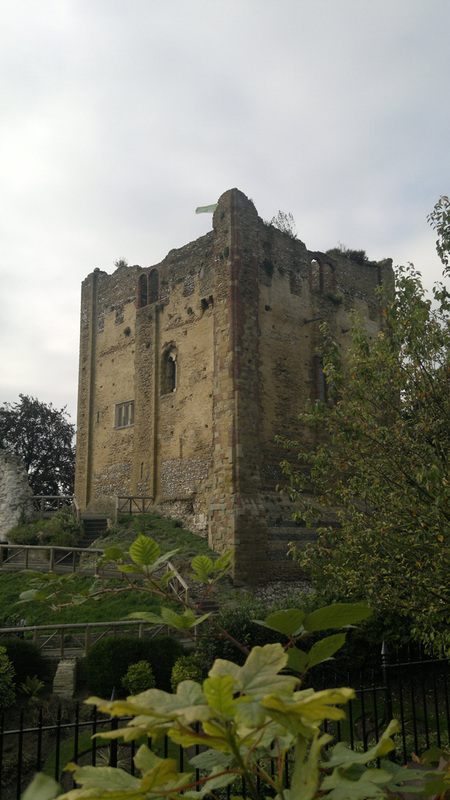 The roof of the tower is reachable by a staircase which allows views of the grounds and parts of Guildford. The Castles old gatehouse now houses part of Guildford Museum, a Local History and Archaeology Museum with a specialist Needlework Collection.